What is a Minecraft 1.8? We’ve waited so long that it bears repeating: Minecraft’s 1.8 update constitutes the most significant injection of new surprises into Survival mode in years. Expect Endermites, Guardians and rabbits. And expect it all within the week. Mojang have just released Minecraft snapshot 14w34b. Theythink it’ll be one of the last before the test patches are coagulated into one official update and distributed to all 16,747,576 Minecraft owners on PC and Mac. If you’re running the latest snapshot version of the game, you can help expedite the process by searching for issues on the Mojang bug tracker and voting up the ones you’ve noticed too. Otherwise, you can sit back and mush all of 1.8’s future features together in your head. There, new stone variants can rub up against sea lanterns and slime blocks, and jostle for brainspace with iron trapdoors, banners, armour stands, barriers and new door types. 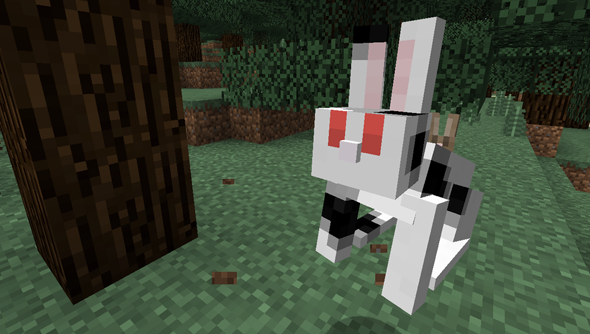 The incoming mobs are most exciting of all: rabbits will be criminally cute and mostly passive – though they’ll occasionally come in ‘killer’ variants. Guardians look like sentient sea mines, and will live in and about underwater temples filled with gold. And Endermites are borrowing, purple grubs left behind after an Enderman teleports. 1.8 will also introduce new customisation options to world creation – and enable the return of floating islands. In the meantime, here are the 30 best Minecraft seeds. What’re you most looking forward to? It’s the bunnies, isn’t it?